Choreographer Mickey Perz reveals his strict ground rule for popular all-male dance group Hashtags. Currently a choreographer for It’s Showtime where he handles Hashtags, Girl Trends, and the recently concluded search for the all-girl Filipino idol group MNL48, Mickey Perz said he takes his job very seriously, especially after he started handling Hashtags last year. “During their concert last year they asked me to handle Hashtags so I choreographed them. So kami yung nag-train sa kanila and also yung Girl Trends. After that they asked me train the second batch na. Wala pa ako sa first batch eh. I wasn’t able to handle them because I had no time. But the good thing about the second batch is yung growth nila within the first six months was so big kasi eager sila and we made a different training, as in besides everyday they are at Showtime to perform, three times a week may training pa sila bukod sa Showtime training. So that’s why yung growth nila and disiplina nila mas maganda,” he told PUSH during the #PerzBaby gender reveal party held last April 29 in Quezon City. Mickey said he made sure to instill discipline in the all-male group. “I told them at Showtime, ‘Sure I want to do it but we have to set ground rules. Kasi para sa akin this is important and especially now it’s important kasi sa generation ng millennials, everything has to be instant. Pero they have to have that attitude na professional. We’re all here to work and we want to do our craft as good as possible. So sa Hashtags nangyari yun. Sa umpisa when I came in, yung second batch eager talaga sila kasi they have it also in general harder kasi they are following the first batch. Yung first batch naging sikat na kagad eh and yung brotherhood nila nandun na. Yung second batch tried to integrate themselves pa muna. Mahirap na kasi parang the others know each other already,” he shared. This new system in the group has already led to some of the Hashtags members being immediately disciplined. “The reason why they are suspended is because I suspended them and the management. Kasi before din also when we were handling yung sa Star Magic, if we handle full circle, kung hindi ka mag-se-stage block, whoever is late sa stage blocking, will treat everyone to Starbucks. As in kahit sino ka they have to pay for everyone. Dito naman ang sabi ko, ‘If you are late, out ka for the whole day.’ Punctuality is very important because they had this attitude na, ‘Ay, okay lang naman na yung blocking ko later na. Darating na lang ako later kasi mamaya pa yung blocking.’ That’s wrong. Sabihin natin Monday you rehearse for the Tuesday production number, pag Tuesday you are five minutes late sa rehearsals, kahit naaral mo na yuung sayaw you don’t dance. You’re out for the whole day. And then ginawa namin for the whole week para maintindihan nila kasi nasanay na sila everyday na I’ll come the next day na. I’m really trying to teach them that they have to have patience and don’t take things for granted,” he explained. Apart from teaching professionalism in the workplace, Mickey said he wants the dancers to value their roots in showbiz. “Kasi pinapakita ko sa kanila na they should not take Showtime for granted. Kahit sabihin pa nila na naka-teleserye sila, Showtime is still the show that made you you and at the same time ang babait ng lahat ng taga-Showtime sa inyo. Masyadong mabait. So why aren’t you fair to them kumpara kung pupunta tayo sa mga taping schedules ninyo, nahihiya kayo sa director, nahihiya kayo sa staff, sa call time. Pero dito sa mismong bahay ninyo nakakalimutan ninyo na lahat ng staff are the reason why you are here now,” he said. 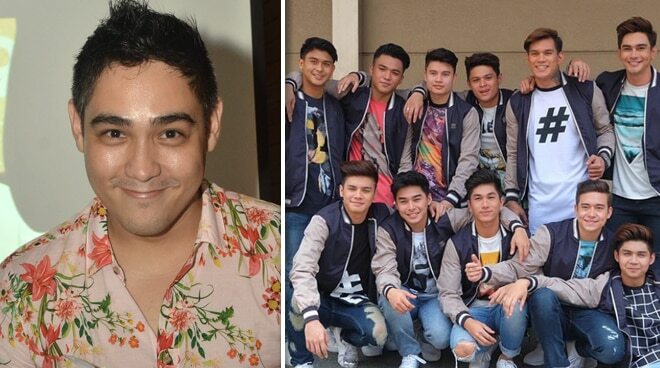 The Showtime choreographer and soon-to-be-dad shared his dream goal for the popular all-male dance group. “Sabi ko sa boys, we had an agreement na, ‘I’m here and I’m passionate about what I’m doing. I want to make you boys the best dance group na sasabihin nila kung dati kami yung Supah Dance Crew nila John Prats, Rayver Cruz, si Gab Valenciano, at ako, sila Maja Salvador at Shaina Magdayao, parang kami yung naging standard ng dance. Ngayon kung grupo ng lalake dance group wala ngayon, sabihin na natin dati yun yung Manoeuvers at Streetboys, dapat in this generation kayo yun. And I’m going to fight for it that you will be that. Pero I can’t do it alone,” he said.